“To sleep, perchance to dream.” Sleep was long believed to be a period of uninterrupted quiescence, when the body slowed down. In 1913, the French psychologist Henri Piéron authored the book Le probleme physiologique du sommeil, the first attempt to examine sleep from a physiological perspective. Piéron also sought evidence that a chemical factor (“hypnotoxin”) accumulates in the brain during waking periods and eventually induces sleep. During the 1920s, the Russian-born American physiologist Nathaniel Kleitman established the world’s first sleep laboratory at the University of Chicago and exclusively dedicated his long career to sleep research; at the time, sleep research appeared on no one’s scientific radar screen. Kleitman’s Sleep and Wakefulness (1939) was the first major text on this topic and is still judged a classic; in it, he proposed that sleep consisted of a rest-activity cycle. He also frequently served as his own subject, and on one occasion, remained awake for 180 consecutive hours to study the effects of sleep deprivation. Sleep is not a unitary and prolonged state of quiescence. Rather, it consists of distinct phases, with REM consuming 20–25 percent of total sleep, some 90 to 120 minutes, divided over 4 to 5 periods; more than 80 percent of newborn sleep is in REM. Its biological function remains the subject of theorizing—perhaps its function is to consolidate memories or for the central nervous system development of newborns—but we do know that loss of REM results in significant physiological and behavioral abnormalities. SEE ALSO: Circadian Rhythms (1729). While REM represents only 20-25 percent of an adult’s sleep, it represents up to 80 percent of a newborn’s sleep. 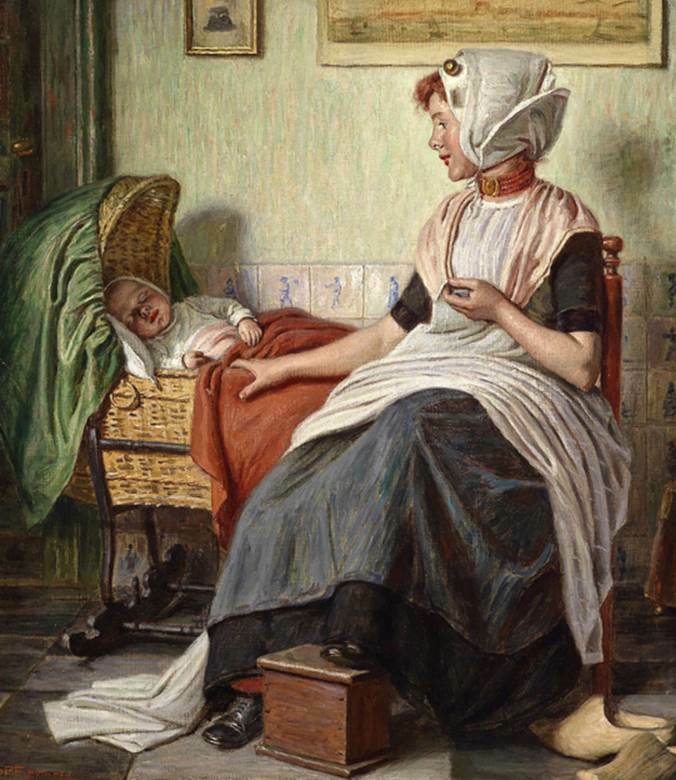 A dreaming infant is shown in this 1928 painting by Hermann Knopf (1870–1928).